Chronic Venous Insufficiency develops when the valves stop working properly. This causes the blood to flow backward and pool in the lower leg veins. There are number of symptoms including heaviness fatigue, burning, itching, leg restlessness and aching pain. Findings may include smaller spider veins, to visibly enlarged varicose veins. Over time, inflammatory skin changes including darkening and thickening of the skin can develop. What causes venous leg wounds? If left untreated, the persistence of pressure induced inflammatory changes in the veins and skin can progress to open wounds or venous leg ulcers. 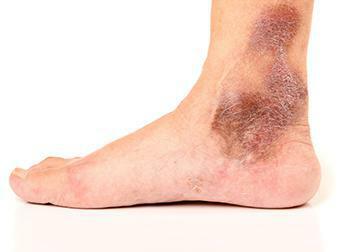 How is skin discoloration and venous leg wounds treated? These ulcers can be difficult to heal and may have a tendency to reoccur. Treatment is directed at reversing the inflammatory changes with appropriate wound care, and addressing the source of the elevated venous pressure. Where treatment is deemed medically necessary, our office will, on your behalf, seek pre-authorization from your insurance provider.